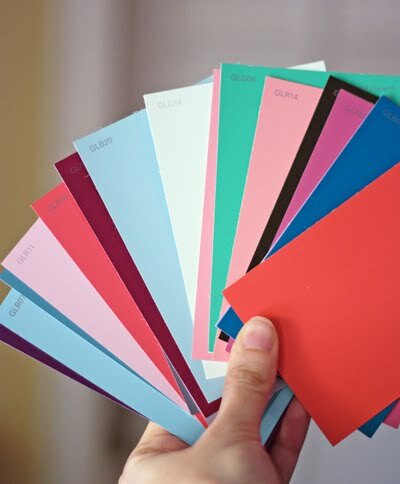 If your apartment needs some decorating, you can't draw, and you're broke, consider chopping up paint chips. These are Glidden swatches from Home Depot made into a simple triangle pattern. I put it inside a mat and frame I already had, and it looks fairly respectable. Put anything inside a mat and frame and it will look respectable. Heck, you could frame a crumpled-up Kleenex and somebody will assume it's a very special piece of modern art. 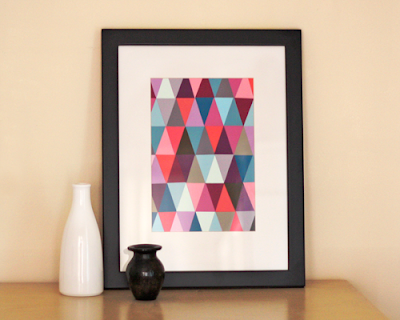 To make this fancy paint chip art, cut swatches into triangles. I found it easiest to trim the swatches into strips first, then cut the angled sides using one triangle as a template. I laid the shapes out in an arrangement I liked, then transferred them one by one to a sheet of paper cut to the size I needed. I ran the paper through my Xyron machine first to make it sticky, but you could also coat your paper with spray adhesive or attach your pieces with rubber cement or other adhesive. 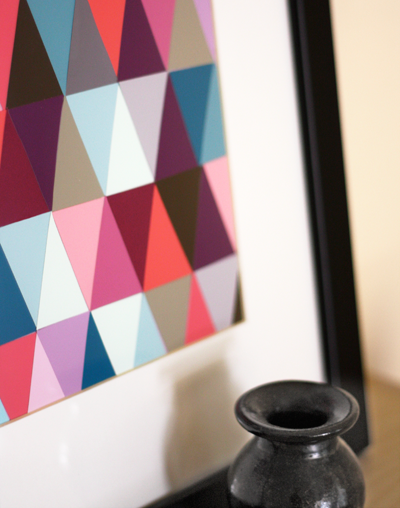 Trim off any overhanging triangles, put it under glass, and you're done. Love, love, love it! Nice fresh twist. TFS! There's been a lot of paint chip DIY's and things, but out of all of them, this one captures my eye the most. This looks like such a cool piece of art to have in your home. MinaAriel, TFS means... ? I usually have my head under a rock so I'm not very hip to the acronyms. whoa! that looks great and pretty simple! thanks! Great concept and so flexible to subjective DIYers! A little Klee-ish, I'd say! :) Like the idea...have to make a trip over to Home Depot or Lowes. So pretty! I must try this! Paint chips are so versatile. This is a great idea! Too great for words, I love this. Definitely going to have to get some paint chips asap. Can't believe how much I love this! We just bought a house and have a ton(!) of paint chip leftovers. Can't wait to give it a try! You choice of colors really makes this project fresh and modern. you did it again! good job - love your color choices too! I seriously love this. I'm surprised how well the colors look together. bbphoto, that was my first thought (as a mother of 3) when reading the post that it would make a perfect and fun Color Theory project for kids without being too scientific, and they would create real art! It looks great and I love how bigger triangles pop in and out of focus. Crumpled up Kleenex in a frame sounds pretty good, actually. And so do the paint chips. I may get some art on my walls after all, thanks! That is really clever and fun! I love it! Would you be willing to share the color chips you got. I have a room that those colors would be perfect for. Also how wide did you cute each strip? Meagan, uh oh. I chopped them all up and threw away the color names! So sorry! I can tell you the finished artwork is 7.5" x 12". (Outer dimensions of the frame are 14" x 18") The triangles are 2" tall and 1.25" wide. So I first cut 2" strips, and then trimmed the slanted sides. This is so beautiful. I love the shapes and especially the colours. WOW! I once made a wallet out of paint chips using a "how-to" found in a ReadyMade magazine. Maybe not durable enough for the long term, but it was a lot of fun. Wow! I have a Stampin' Up! punch that is perfect for this! Love the idea! Love this isea, always great so see a new way of adding colour at low cost. Rhanks for sharing. love it!! gonna try it for sure!!! I love it! And I thought there wasn't anything left to do with paint swatches. The pattern would make a great fabric. I would definitely but some for a pillow. What a gorgeous project, this is one that I certainly need to try out! Such a great make! Looks great! I will be making one of these for my dear friend!!! I am impressed! What a great use of paint chips, I can imagine all the amazing patterns that can be created, Thanks for sharing this idea! I am going to make it a project together with my kids. That is fantastic and easy enough to do though I never would have thought of it! Sure, feel free to grab a photo and link over. I just ask that people don't republish posts in their entirety. Thanks! This is a really great piece of artwork! Love the idea - must try . . . along with another commenter's idea of using a punch . . . my wheels are starting to turn! amazing this art..i think more artist in India but this art is so different and good..
Love this idea! You chose great colors! Jessica, thanks for sharing this fun and great looking project. And thanks for letting us share it too! I'll be sharing it on my stamping blog and of course linking to you - thanks again! This pieced saved my life! I did one with paint chips, but them thought, what else is there? And then began my obession. I started doint them with cambel's labels and pictures! This is amazoing ans easey and soooo fun! Fantastic, I love how clever you are! Thanks again for making my house beautiful! This is very cool. I picked up some paint chips in fall colors to make a piece for my hall. :) Thanks for the idea! Thanks for the inspiration! I made some fun paint chip art myself- whimsical faces! I have included it in a list of great tutorials for men...and everyone. Thanks for taking the time to put it all together and share it. don't know how i missed this the first time around..but found this on pinterest and became obsessed. so creative! it's so special, i'll try to make it (i've great empty wall ^^..) , thanks for the inspiration. I'm sorry, but I'm still trying to understand how you cut them. I feeling like I just can't understand how you got them so perfect! Could you go thought cutting them a little more in depth, please? And this craft is the best paint chip art by far!!! I'm using that frame for something else now and I can't remember where I put the paint chip artwork, so I don't have exact measurements for you. But it was something like this. Cut the paint swatch into long strips, lengthwise. Make the strips as tall as you like, as long as they're all the same. This dimension will be the height of your triangles. So you'll end up with strips that are... maybe 1.5" or 2" tall? Then cut off a triangle to use as a template: with a pencil and ruler, on one edge of a strip mark off the width for your triangle. Maybe 1"?? Then on the opposite edge of the strip, mark the midpoint for the apex of the triangle. Cut out this triangle: Either draw pencil lines and cut along them carefully with a scissors, or use a ruler and Xacto knife. 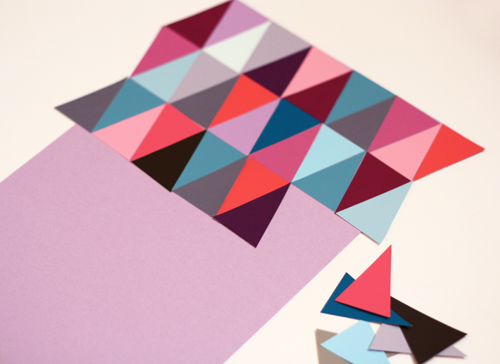 Or, if you have trouble positioning the template piece to get uniform triangles, don't use it. Mark all the points with a pencil and ruler and cut using an Xacto knife run alongside a ruler, for perfectly straight edges. Thanks so much, Jessica! I'm off to get more paint chips! I don't feel as guilty going to Walmart rather than Home Depot. I did something similar to this once. I made a "Mother's Day Card" using paint chips. 1)I just them into strips ranging from about a fifth of an inch, to a half inch wide. 2)I glued them down to a plain card, in a Parquet pattern. 3)Then I placed a decorative sticker in the middle of that pattern. 4)And last, I wrote a message on the inside of the card.